At Zojirushi, we’re inspired by everyday cooking, at home, in any kind of kitchen, and for large and small families. We design our small appliances to meet your day-to-day needs, and our Micom Rice Cooker & Warmer (NL-AAC10/18) is one of the best examples of the effortless practicality and stylish functionality that guides our product design. This is made in Japan and comes in 5.5 and 10 cup capacities. It’s also smartly multifunctional. At its core, it cooks rice and rice mixed with grains, such as barley and adzuki beans. 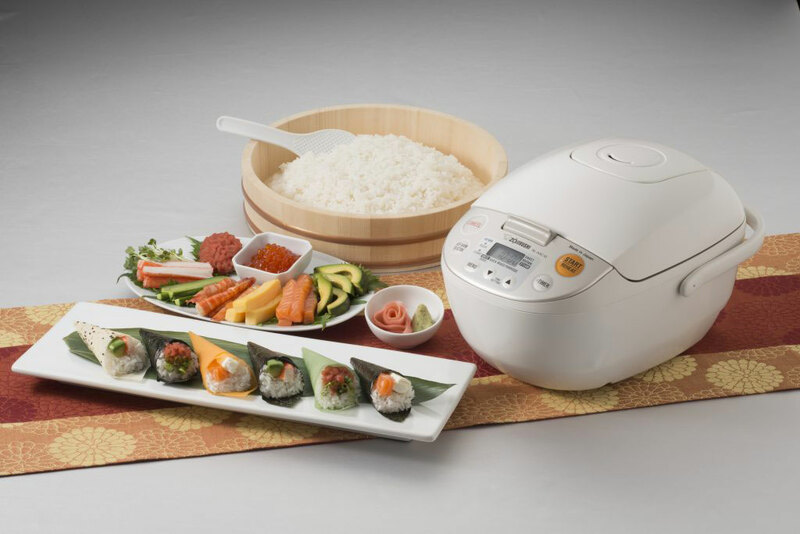 But this rice cooker also features a Steam function, which allows you to cook vegetables, fish, scallops, prawns, chicken, meat-filled potstickers, or dumplings. Rice is cooked using one of six pre-programmed settings: White/Sushi Rice, Mixed Rice, Porridge, Sweet Rice, Brown Rice, and Quick Cooking. Each of these settings, along with the one for Steaming, are accessed on the easy-to-read LCD control panel. 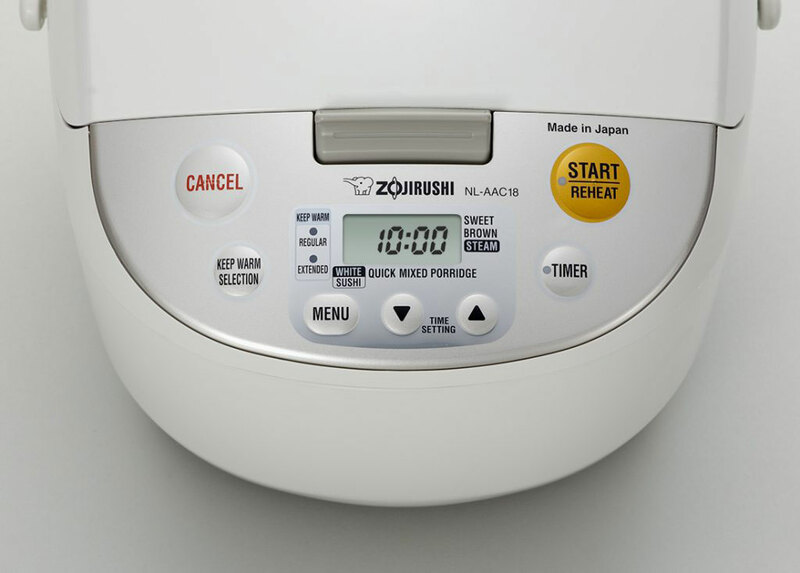 Once the desired setting is selected, the rice cooker uses fuzzy logic technology – which cleverly directs the appliance’s microcomputer to make fine adjustments to cooking time and temperature – to make perfect rice every time. White Rice and Brown Rice are easy to make; simply select the White/Sushi or Brown Rice setting. But this rice cooker also allows you to make mixed rice, such as rice with barley or Shiitake-Gohan (Shiitake Mushroom Rice), by adding stock, seasonings and vegetables directly into the rice cooker along with the rice. The instruction manual that comes with the rice cooker has smart tips on how to get the best results for all kinds of dishes, including the correct proportion of rice to other grains, how to rinse rice for the best results, and how to season rice for cooking. The black inner pan is ideal for helping you with assembling and cooking your dish. Markings on the inside of the pan serve as a guide for how much water to use and the heating element evenly heats the ingredients. Once the dishes are cooked, the rice cooker will either make a beeping sound or play a melody, and will keep the food warm using the Automatic Keep Warm setting or the Extended Keep Warm setting. We use this feature along with the Delay Timer, which allows you to program when you would like the rice to be finished cooking. We often fill the inner cooking pan with rinsed rice and water in the morning, set the timer for the evening, and leave for the day to come home to cooked, fresh rice. The rice cooker will automatically keep it warm, and when we come home, we simply open the lid to eat or add ingredients for dishes like Green Tea Rice. 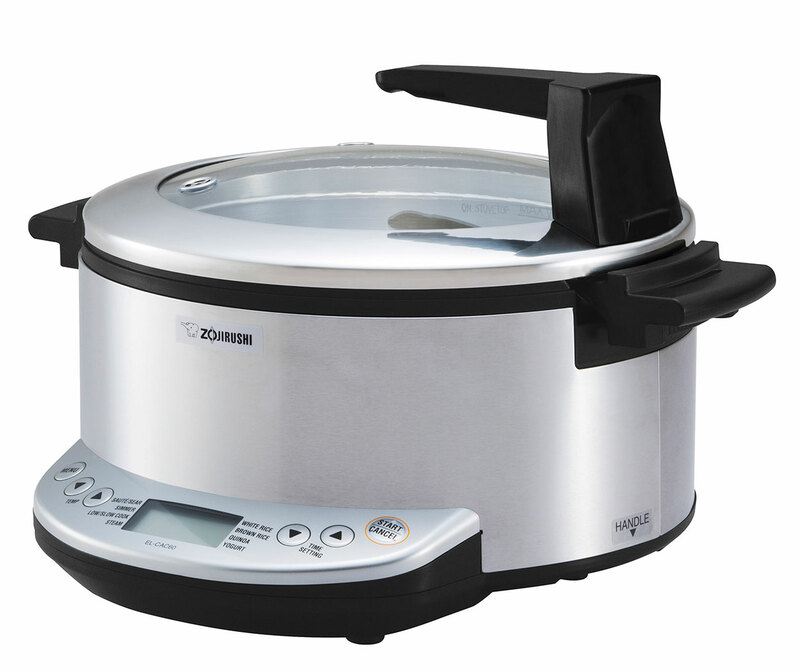 The Steaming function is another ideal feature in this rice cooker. To steam your favorite foods, fill the inner cooking pan with the appropriate amount of water, insert the steaming basket securely into the inner cooking pan, then place your foods into the basket. Select the Steam setting from the LCD panel and set the cooking time. 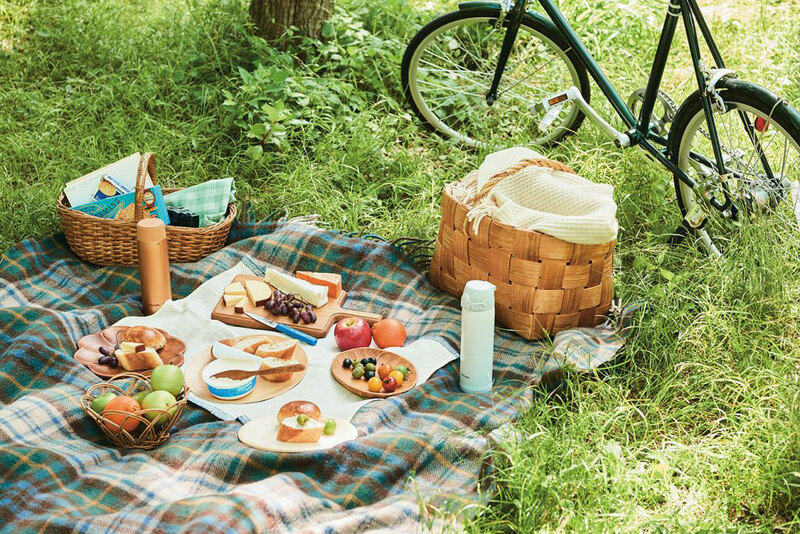 Before you know it, your food will be prepared and ready to eat! A rice measuring cup, rice spatula, and the steaming basket accessories come with the rice cooker. Maintaining this rice cooker is also simple and practical. The inner lid, which covers the cooking pan, is detachable and washable, as are the removable inner cooking pan, steamer basket, and spatula. Simply wipe the inner and outer surfaces of the machine to clean them. And when storing the rice cooker, remove the detachable power cord and fold it up neatly next to the machine. We hope you try out the great recipes found on pages 18-21 of the instruction manual, and try out some of our favorites from Zojirushi.com. As always, be sure to share your favorite dishes with us! We’ve got it! We’ve designed a brand new, stylish Toaster Oven – and it’s just as practical and packed with features as all of our other great small appliances. Our Toaster Oven (ET-WMC22) is a compact machine, able to toast two large slices of bread, making it ideal for individuals and small families. It fits beautifully on any counter top and comes in a sleek and glossy black finish. 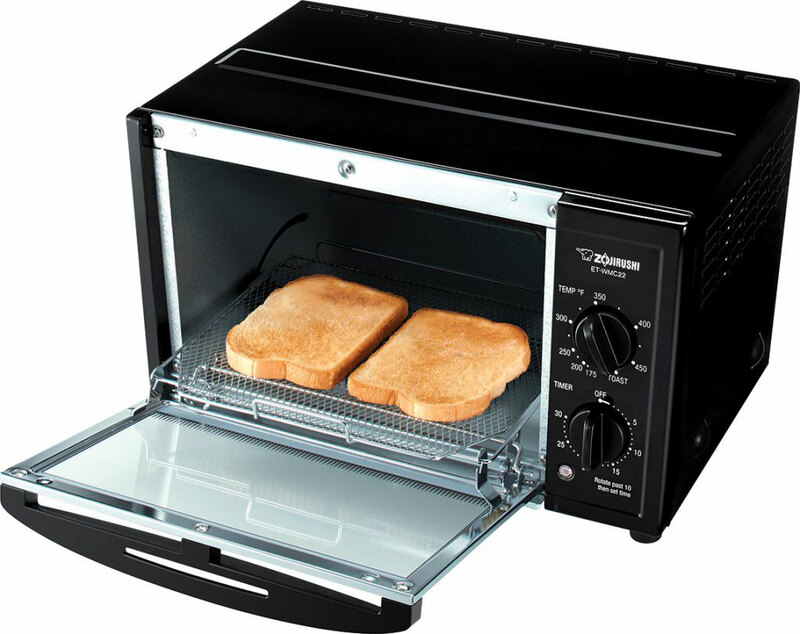 The Toaster Oven lets you cook and reheat various foods effortlessly, along with toasting bread and mochi. The cooking settings are controlled by two dials on the Toaster Oven – one that sets the cooking temperature and one that sets the cooking time. The temperature dial adjusts the cooking temperature from 175°F to 450°F, perfect for cooking or reheating various foods like cookies, pizza, and mochi rice cakes. The timer dial can be set up to 30 minutes. 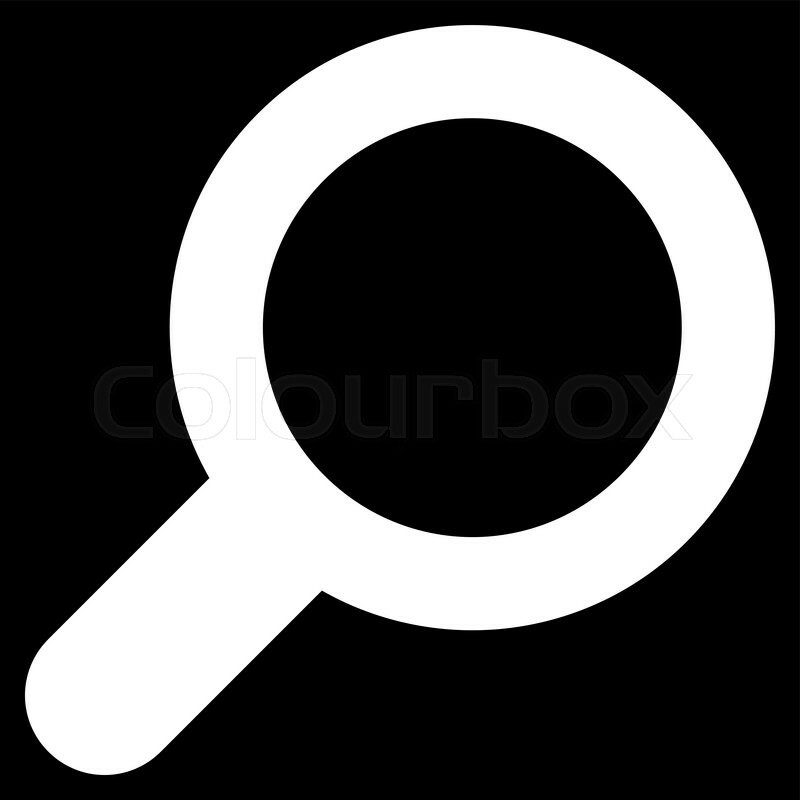 Cooking guidelines for foods commonly cooked in a toaster oven are imprinted on the door and indicate the appropriate dial settings for these foods…super easy when you want to make something quickly! Food is placed on a mesh rack which helps foods cook more evenly while also reducing grill marks on foods. The mesh rack is especially useful when cooking mochi rice cakes, as it minimizes dripping through the rack. Foods can also be put on the Baking Tray accessory, which is great for roasting vegetables. Both the rack and tray are pulled out automatically when the glass door of the Toaster Oven is opened. 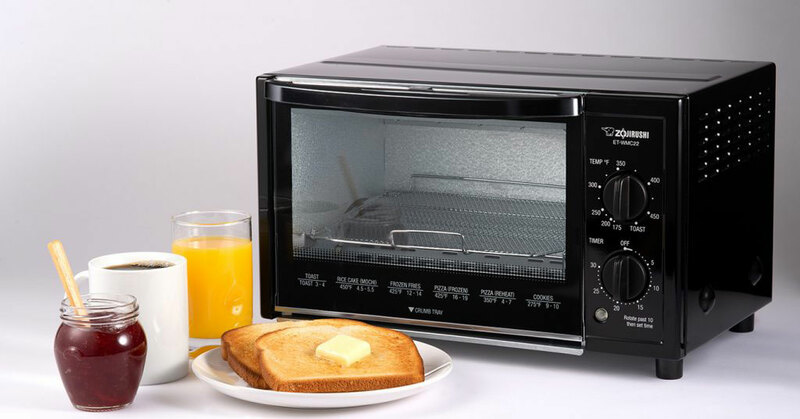 Whenever the Toaster Oven is on, a bright light indicates that it is in operation, and an audible bell signals when the course is completed. One of the great features of this Toaster Oven is Zojirushi’s commitment to Safe Design. All surfaces that come into contact with food are BPA free. The heater guard at the top of the Toaster Oven prevents accidental contact, while a guard on the bottom directs fallen foods away from the heater. The auto pull-out rack reduces the risk of burns when removing foods. And as with our other appliances, the Toaster Oven is easy to maintain. The glass door, mesh rack, and crumb tray can all be removed and washed for thorough cleaning. Our Toaster Oven comes with an instruction manual that has some delicious and simple recipes including Roasted Vegetables and Oatmeal Raisin Cookies. Keep checking back on our website for more recipes and definitely checkout the beautiful Toaster Oven (ET-WMC22) in our product video. We’re so excited to introduce our Multicooker (EL-CAC60). This appliance is amazing for making foods from so many cuisines – American, Japanese, Mexican, Italian, Indian and many, many more! 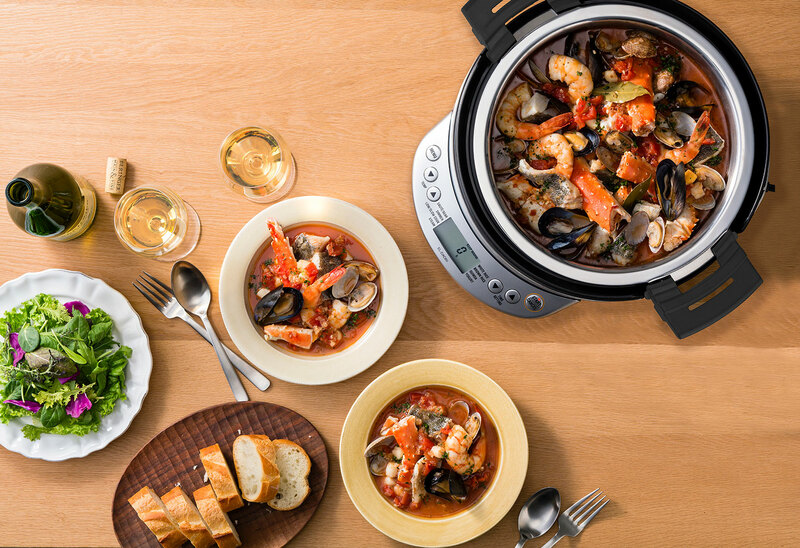 So…do we tempt you with the foods you can make in the Multicooker first or the awesome features of this appliance? The Multicooker comes with nine menu settings which include Sauté/Sear, Simmer, Low/Slow Cook, Steam, White Rice, Brown Rice, Quinoa, Yogurt and Keep Warm. To sauté or sear, simmer, slow cook or steam, choose one of the settings, the temperature and the time. With the Sauté/Sear setting, we made Gumbo and Pot Roast. Then we used the Sauté/Sear setting to start dishes like Sukiyaki and Texas Chili, which we finished off with the Simmer setting. (Yum.) Using the Low/Slow Cook setting, we made Cioppino and Miso Soup, as well as fresh Tofu. (Hungry yet?) With the Steam menu setting, we made Steamed Dumplings and delicate Steamed Fish with Ginger and Scallions. And if you want to make white rice, brown rice, quinoa or yogurt, the Multicooker automatically selects the correct cooking time and temperature, adjusting for perfect results each and every time. Cioppino! Need we say more? And best of all, these menu settings can be customized, like the Low/Slow Cook setting. It can be adjusted to four different temperatures, ranging from 140°F, 160°F, 180°F to 200°F. The Sauté/Sear setting has two customizable options, one for browning meat (410°F) and one for sautéing aromatics like garlic and onions (350°F). Even our Simmer setting has a High or Low option! 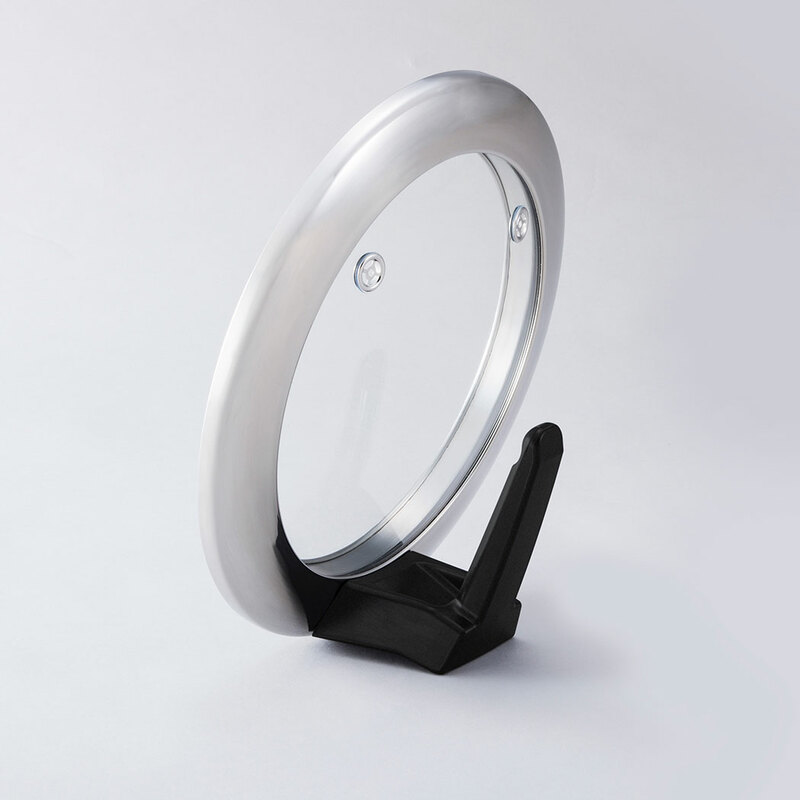 Self-standing lid keeps your countertop tidy and clean! So, how does the Multicooker do all of this? It comes in a 6-quart capacity, and features a tri-ply 18/8 stainless steel cooking pot that rests inside the main body, secured there using convenient resin handles, which stay cool during cooking. The inner cooking pot is 10” in diameter, ideal for larger cuts of meat and poultry, and holds and distributes heat evenly. The cooking pan rests on a large heating plate with 1,350 watt high-powered output allowing high temperature cooking like sauté and sear. Unlike a standard crock pot or slow cooker, this combination of cooking pot and heating plate lets you braise, sear or sauté foods prior to slow cooking. 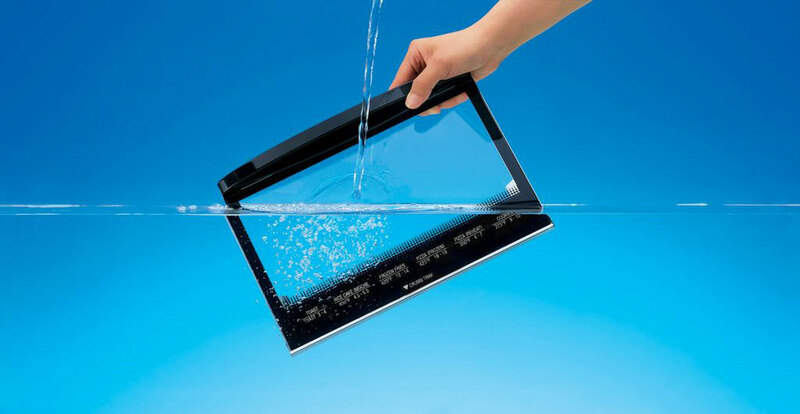 The cooking pot is topped with a lid made using clear, tempered glass so you can view foods as they cook. An upward-facing control panel makes it easy to use. The Multicooker features our smart technology, and uses a microcomputer to provide preprogrammed settings and an upward facing LCD control panel to control time, temperature and menu settings. And it features our commitment to safe design through the user of a concealed heating plate, a removable power cord that detaches when snagged to prevent the hot pot from falling off the kitchen counter, and a spill guard that directs hot overflow to avoid accidental scalding. Accessories include a full-color recipe booklet, a stainless steel steam basket and rice measuring cup. We can’t wait to hear what you’re cooking up in your new Multicooker (EL-CAC60). All of our recipes are in the recipe booklet, and we’d love to know how they turned out for you. Let us know in the comments below or on our Facebook and Twitter pages! Simply tag #zojirushi! Ahhh, December. The time of year for holidays and for hunkering down with warm, wholesome foods. 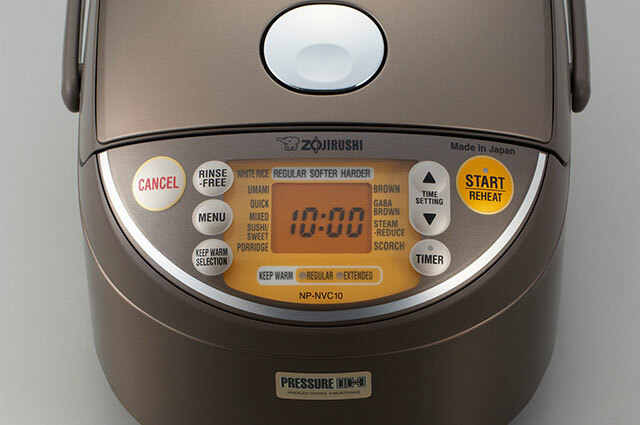 At Zojirushi, we’re obviously fans of rice as a staple of those warm meals and are showcasing our top-of-the-line Induction Heating Pressure Rice Cooker & Warmer (NP-NVC10/18) to get you through the winter. This rice cooker combines multiple cooking technologies to provide top-notch results each and every time. It’s made in Japan and comes in two sizes, 5.5 cups and 10 cups. 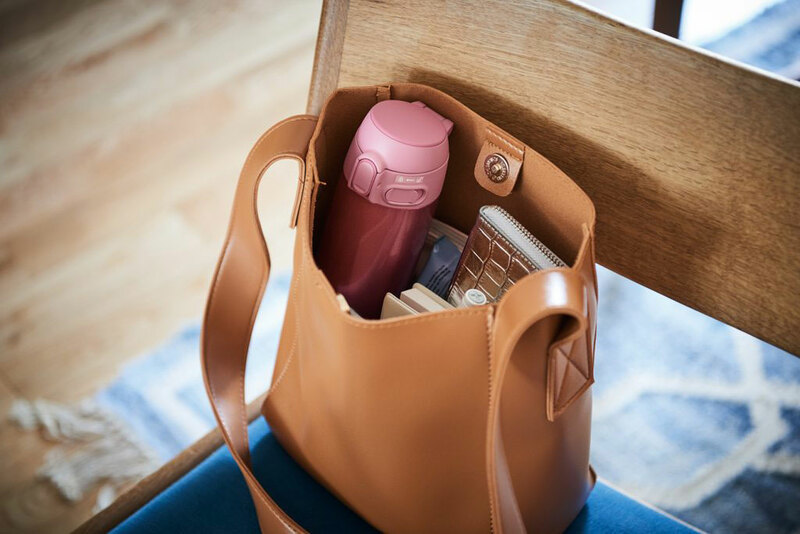 As with our other rice cookers, it’s styled to coordinate with any kitchen décor and comes with two measuring cups and a rice spatula for your convenience. But really, the most innovative features of this rice cooker are its technologies, including induction heating (IH) and pressure cooking, both of which are controlled by the fuzzy logic technology with artificial intelligence (AI). Whew! Say that fast 10 times! Knowing how these three technologies work together helps to really understand why this is a superior rice cooker, so get ready for some tech talk. This rice cooker uses induction heating as one of its cooking methods. When you look inside the rice cooker, you won’t see a heating element or plate, like those used in a radiant heat-dependent appliance. Instead, this rice cooker has a system of magnetic coils that are hidden within the body of the machine. When electricity is run through these magnetic coils, they instantly heat the stainless steel of the inner cooking pan, making the pan itself the ‘heating element’! The heat can be controlled for precise tuning during cooking and the resulting rice is perfectly cooked, every time. This rice cooker also uses pressure cooking to cook rice. Pressure cooking is simply the act of heating food under steam pressure in a sealed vessel, forcing liquid into the food in order to cook it. 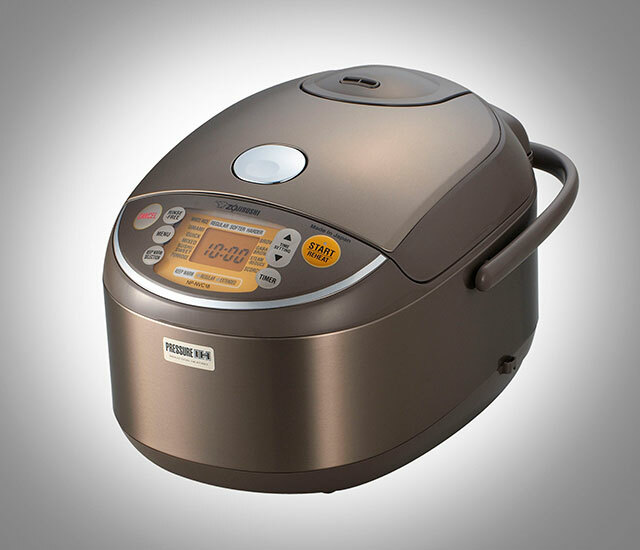 In the case of our rice cooker, once the menu setting has been selected, the machine automatically selects from the pressure levels that result in hard, medium or soft rice–the more pressure, the more liquid forced into the rice, and the softer it becomes. 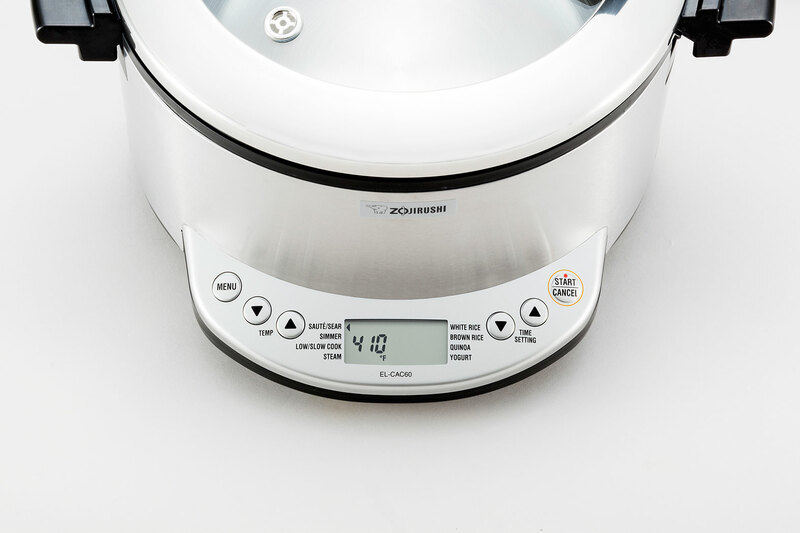 In our rice cooker, applying pressure while cooking also helps convert the hard beta starch in raw rice into alpha starch, making it softer and easier to digest. For example, brown rice will need more water forced into it to make it soft and fluffy whereas sushi rice won’t, since it needs to have a firmer texture. Plus, rice cooked under pressure has been found to stay softer longer, perfect for rice that will be stored before consumption. Both cooking methods are controlled by the rice cooker’s microcomputer, or Micom for short. It’s programmed using advanced fuzzy logic technology with artificial intelligence that adjusts the cooking time and temperature for each menu setting. Fuzzy logic is important, because it can make subtle adjustments the cooking process, creating a flow that results in rice that’s perfectly cooked every time. Considering there’s so much technology in this rice cooker, it’s surprisingly easy to use. All of the menu settings can be selected from the easy-to-read LCD panel and include menus for White Rice, in regular, softer or harder textures (see… different pressures! ), Mixed Rice, Sushi/Sweet Rice, Porridge, Brown Rice, GABA Brown Rice, as well as Zojirushi’s exclusive UMAMI, Steam-Reduce and Scorch settings. 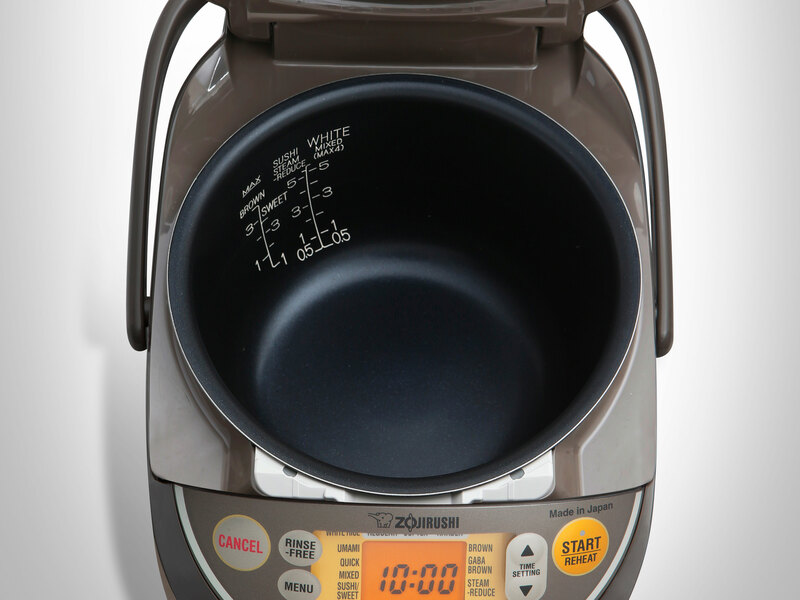 The Delay Timer, also accessible from the LCD control panel, allows you to program when you’d like the rice to be ready, and Keep Warm and Reheat settings keep your rice hot and fresh when you’re ready to eat. Inside the machine, the easy to clean platinum-infused nonstick inner cooking pan (which heats beautifully because of induction heating!) 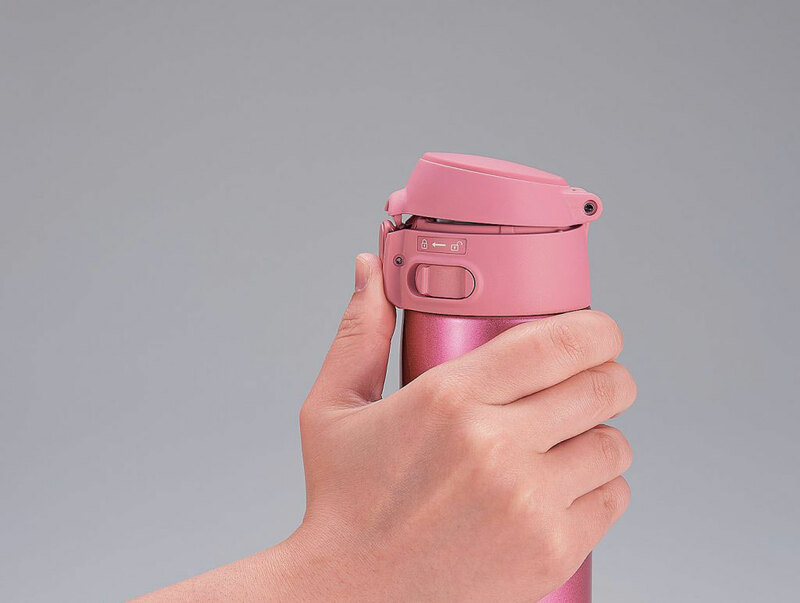 makes sweeter tasting rice, and the detachable inner lid is fully washable and equipped with a filter to prevent small food particles from becoming stuck in the pressure system. With all of these features, we know you’re going to make amazing dishes. Our favorite warming dish are Garlic Flavored Beef Yakimeshi, Kimchi Fried Rice and Rice and Beans with Bacon and Collard Greens. Check out some more rice cooker recipes on our website! Happy cooking and happy end of year! And don’t forget to share your favorites with us below.